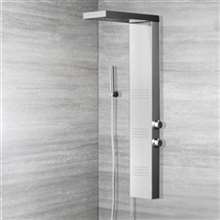 Shower panels system comes with a rain shower overhead, a stylish hand held shower head, a mirror & massage jets. 1 Years Parts Warranty Against Manufacture Defect. This shower panel looks great. The design is very contemporary and works well with my bathroom’s existing design and theme. 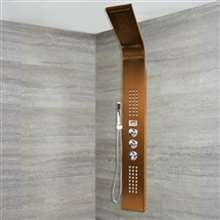 The features are also good, and everything that I needed from a shower panel is here. 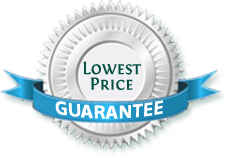 It’s also quite reasonably priced, so I think this one’s a good deal. This is the very first shower panel that I've ever had installed, or ever had in my life for that matter. It was a pretty expensive purchase, but I think that every penny was worth it. It doesn't look as great as I imagined it to be, but it does look like what is shown in the picture, so I really don't have any complaints about the. The functions though from the massage jets and everything else are just awesome. There was actually nothing wrong with the showers in the upper suites, it's just that we felt that we needed to have them replaced because one, they're old, and two, we need to keep up with modern standards. So we decided to have three of these installed, and we're mighty pleased that we did. Not only has these shower panels improved our bathrooms, but our guests can't help but comment on them as well. I've always wanted to have one of these shower panels, and after going over the different ones available on this site, I finally decided on this one, and a great choice at that, too. The shower panel looked great in the picture, but it looked even better once installed. The whole system worked great, from the shower head to the body jets to the handheld and everything else in between. Two thumbs up!